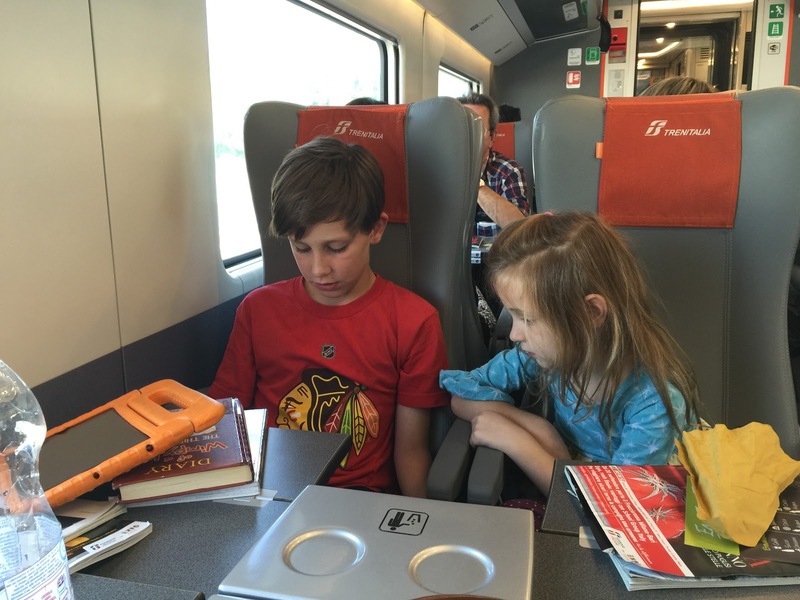 In Switzerland, the kids get a Fall Break. 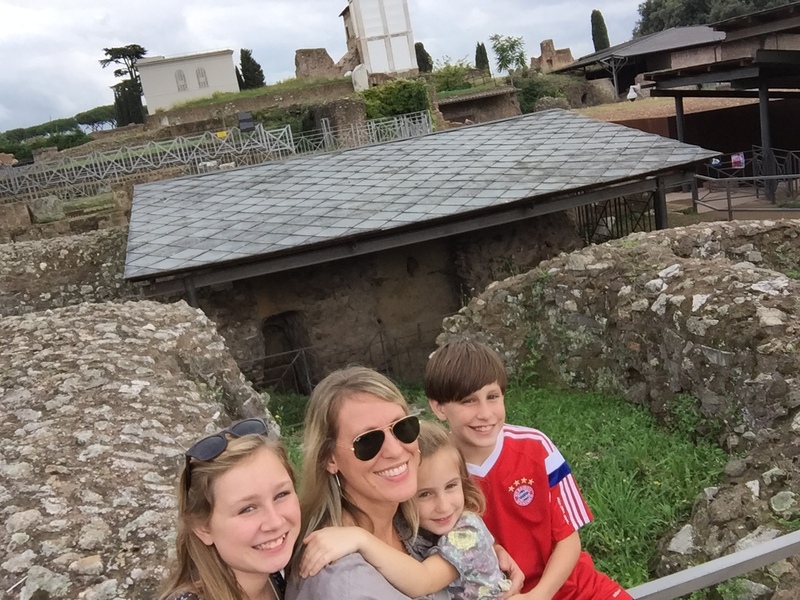 Our kids were off for 2 1/2 weeks in October, so we decided it was the perfect opportunity to see Italy. 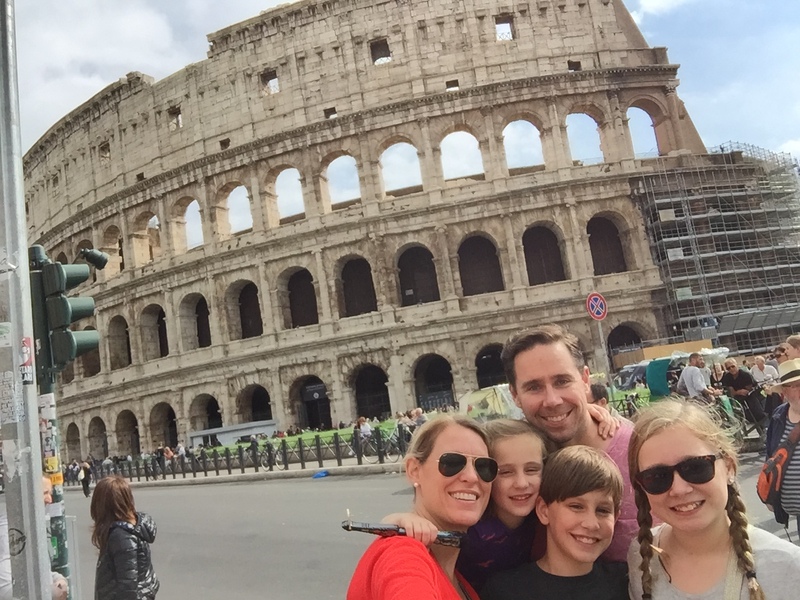 I found a great deal on flights in and out of Rome (around 50 franc each, round trip! ), so it was an easy decision. We started our trip in Rome. 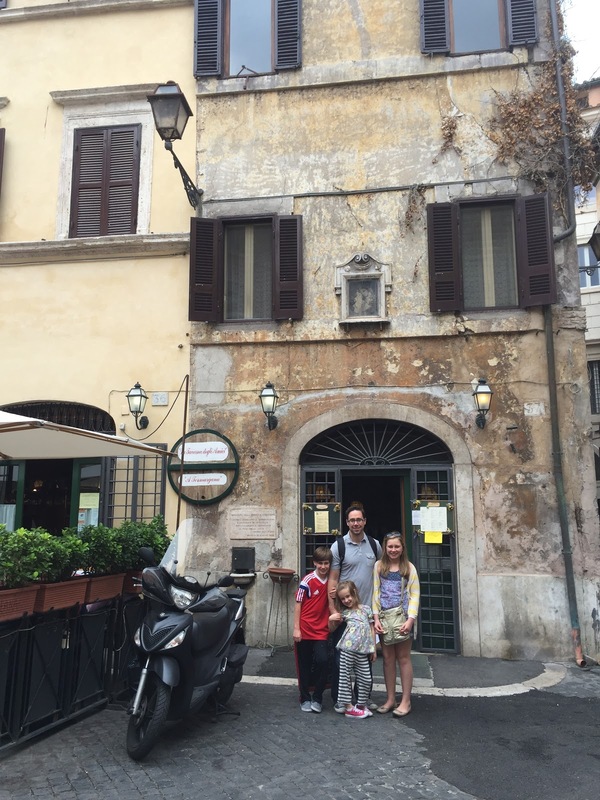 Our apartment was in a cool, old building off of Piazza Barberini. It was up several flights of winding marble stairs, and had an old-school Italian feel to it. 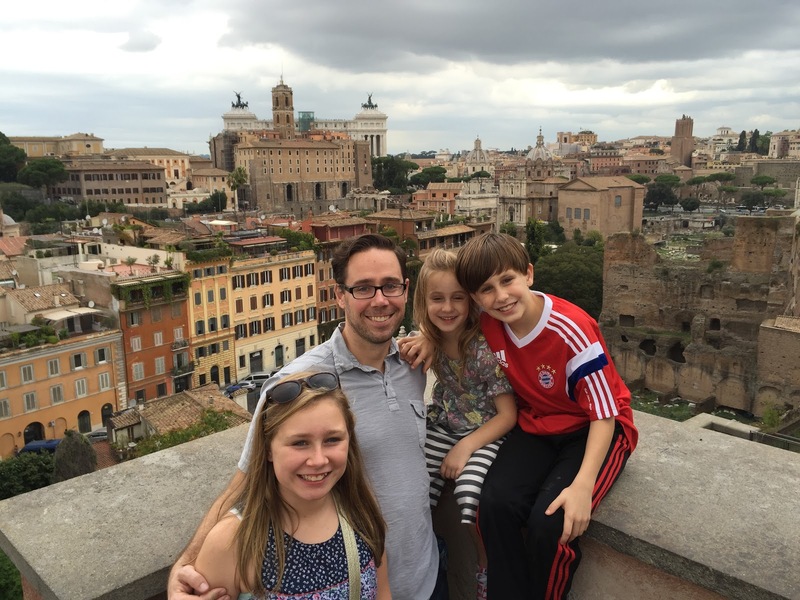 Our first full day, we boarded the metro, which was located close to our apartment, and hurried off toward Vatican City. We booked a tour through Walks inside Rome and had an excellent tour guide in Paola (who very closely resembled our good friend and U.S. neighbor, Laura Tanny). 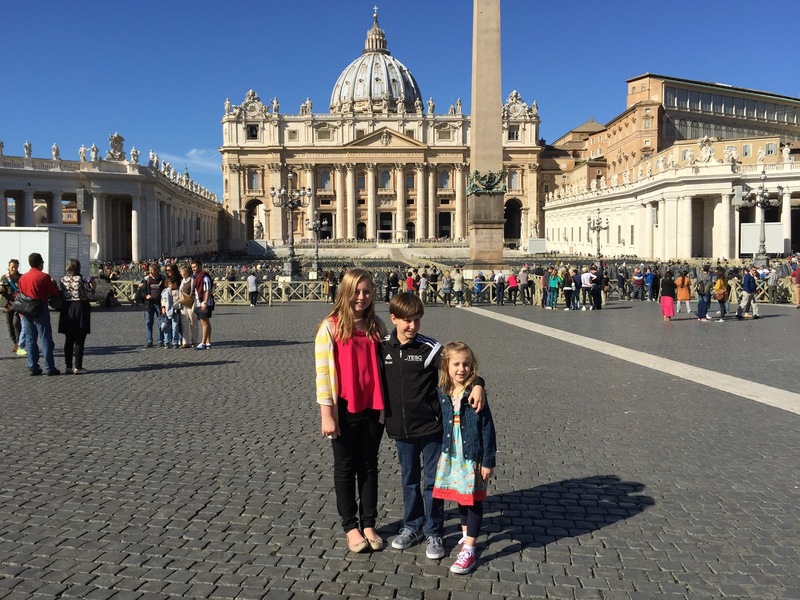 The tour allowed us to skip the line into Vatican City, which was a nice perk. We almost missed our chance, though, after getting a late start and realizing the metro stop we were getting off at was not very close to Vatican City. After running a few blocks (dragging the kids) and waiting in the world’s longest coffee line, we guzzled our caffeine and got into line just in time to enter with Paola. We also booked the tour with our friends from California, who we have come to know through ISSH. Paola, our tour guide, with (l-r) Erik, Kyan, Sophia, Juliana, and Vincent. Paola was able to engage the kids by telling stories that appealed to them about the things they were seeing. She kept it light and entertaining. Paola educating us on the Popes. 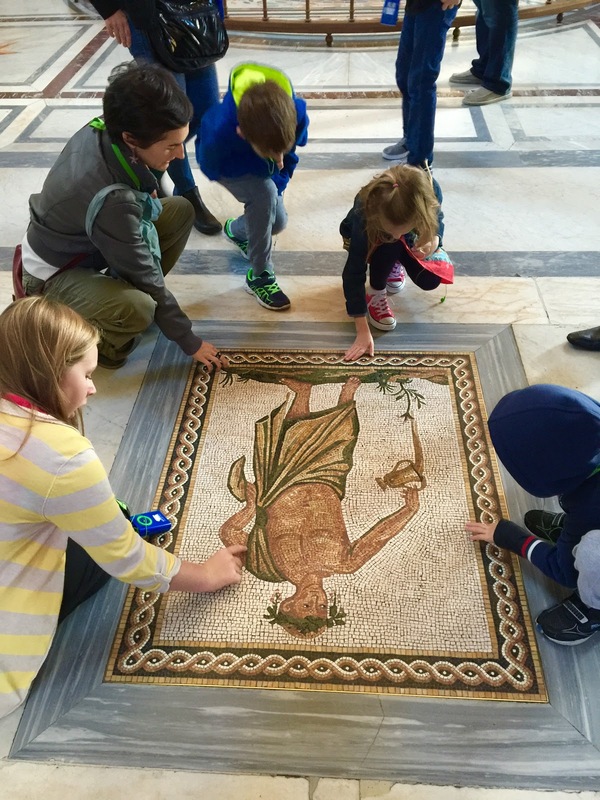 Getting hands on with Paola in the Vatican Museum. 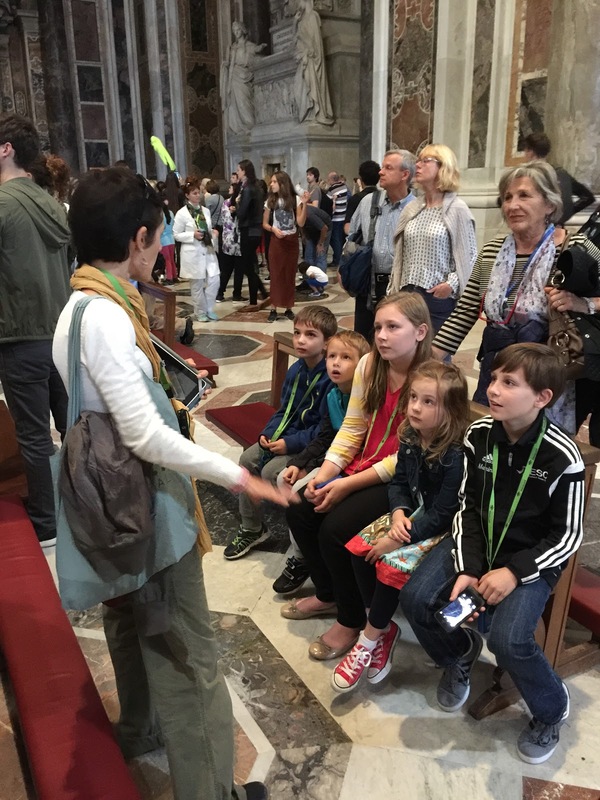 The were particularly engaged by the silence in the Sistine Chapel. Having handouts to look at (from Paola) helped them locate various parts of the artwork on the ceiling. I don’t have any photos of that,since cameras are not allowed in the Sistine Chapel. But it was stunningly gorgeous and the kids were mesmerized. 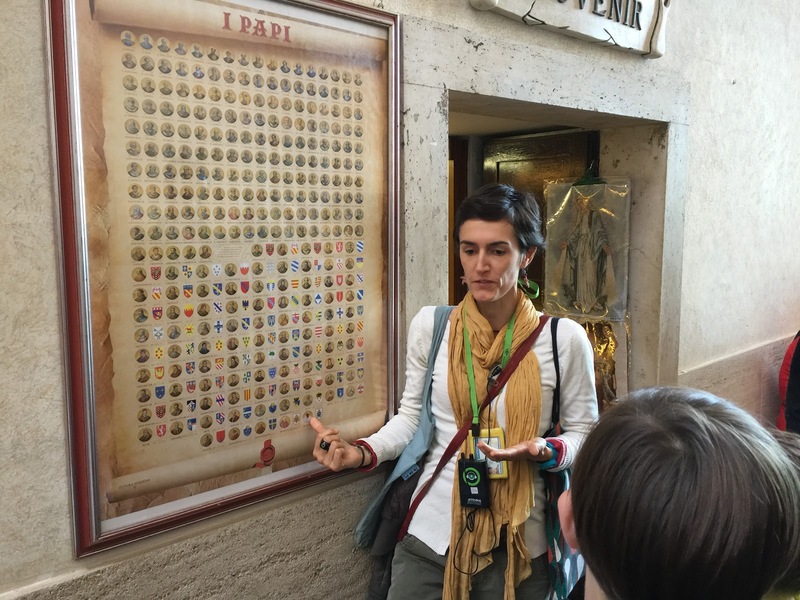 Paola showing us the Vatican Museum. 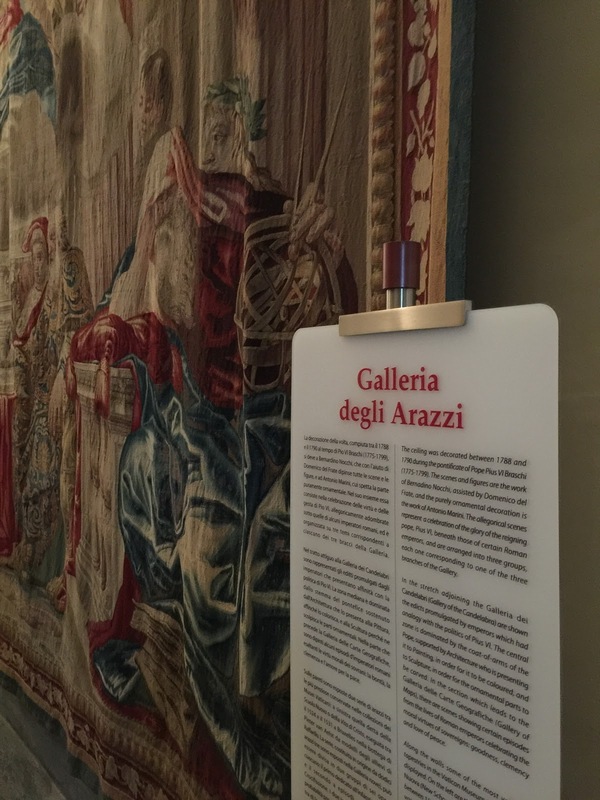 A huge tapestry in the Vatican with our name on it. 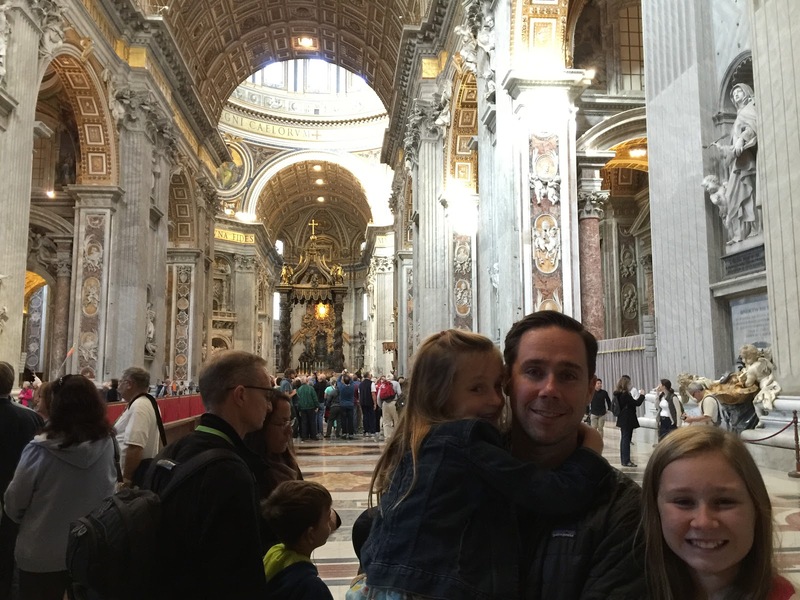 Handsome dad with his girls in St. Peter’s Basilica. We ended the tour in St. Peter’s Square. I love the photo below because it shows you just how bright and sunny that day was. 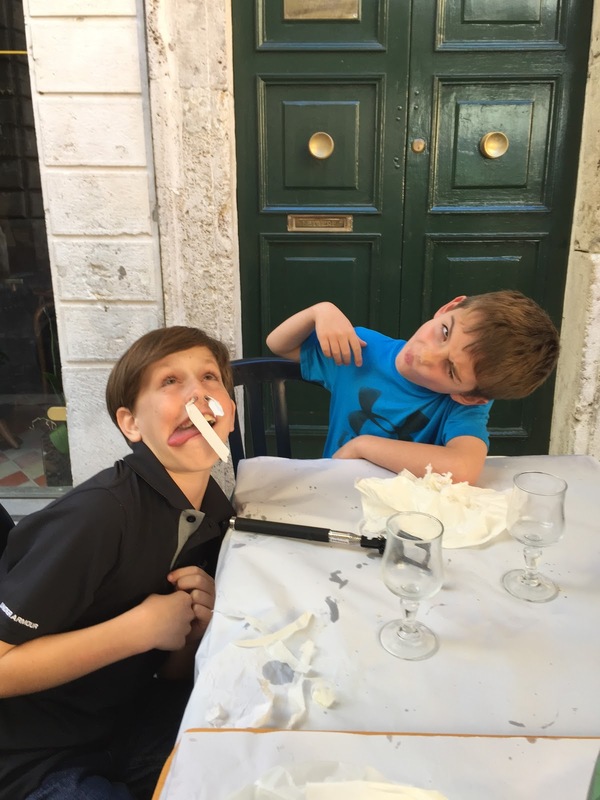 The kids could barely open their eyes! It was a stunningly beautiful fall day. We were so lucky. Squinty eyed on a very sunny day in St. Peter’s Square. 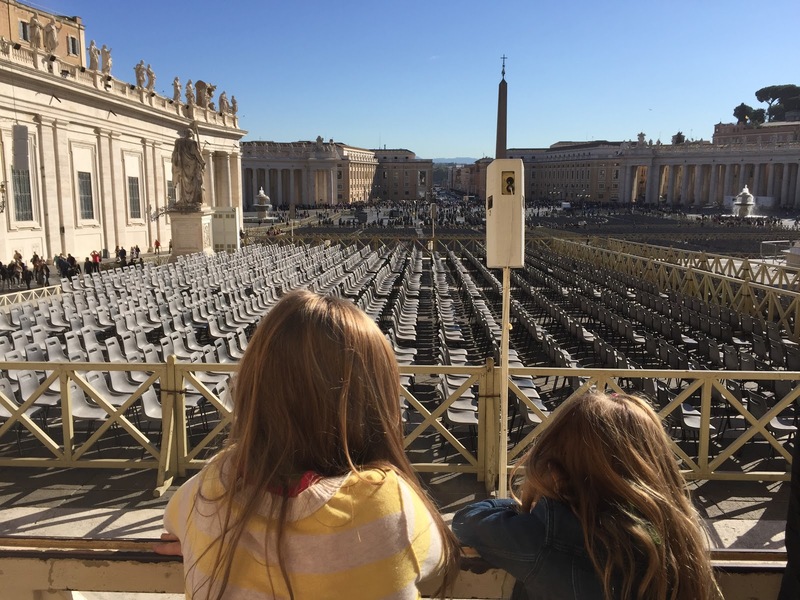 The girls looking out over St. Peter’s Square from where the Pope delivers mass. 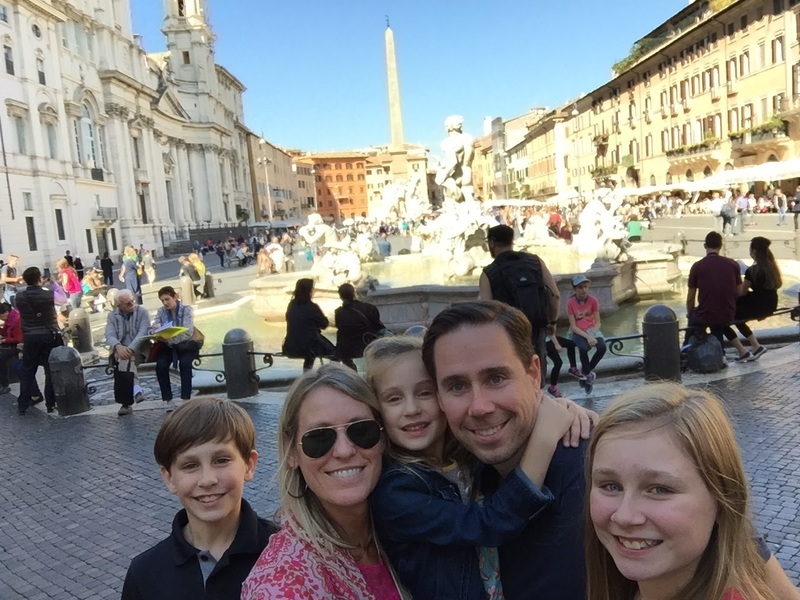 We walked to Piazza Navona and bought selfie sticks along the way. Here we are testing one out! 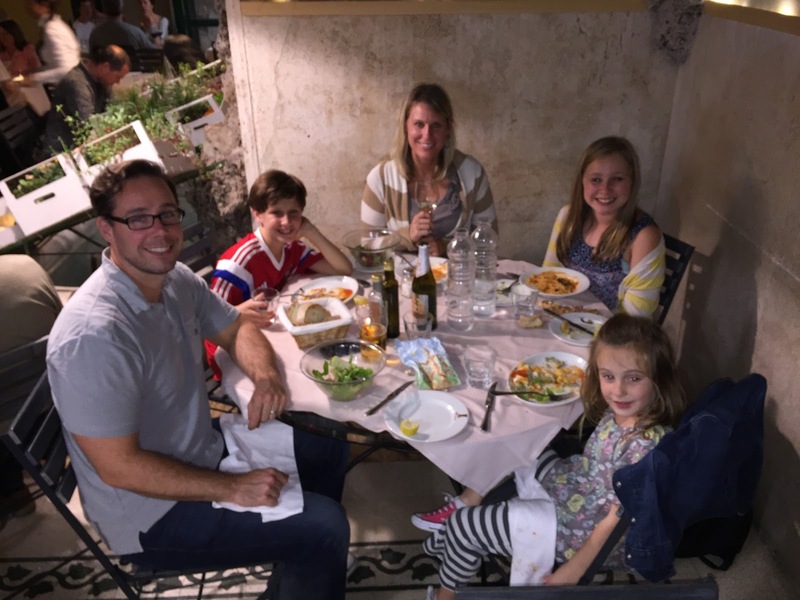 This restaurant was recommended to us as having the best gnocchi in Rome! And it was spectacular. 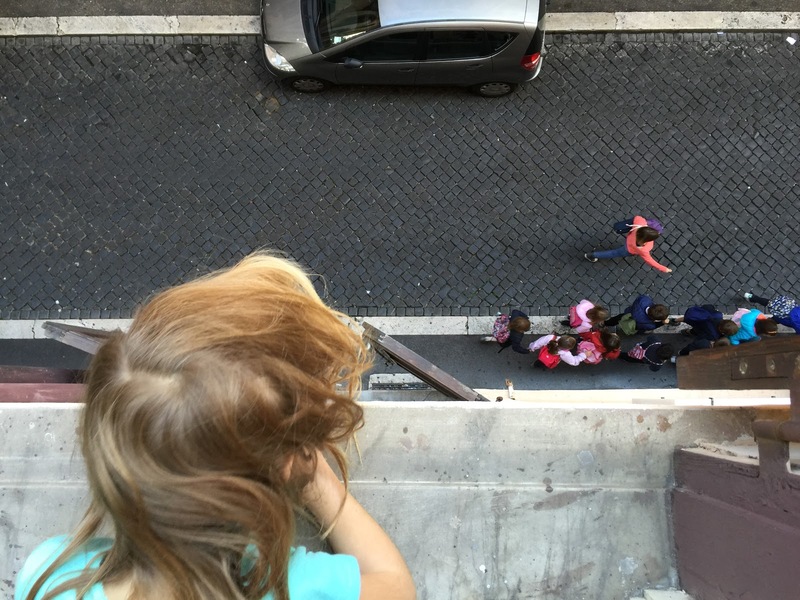 Juliana watching Roman school children to walk to school from our apartment window. 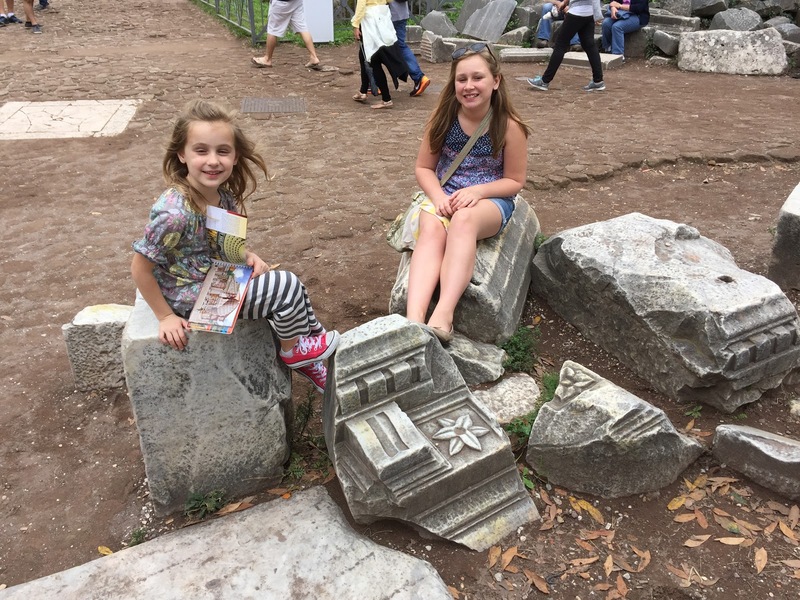 The next day, we were off to explore Ancient Rome! 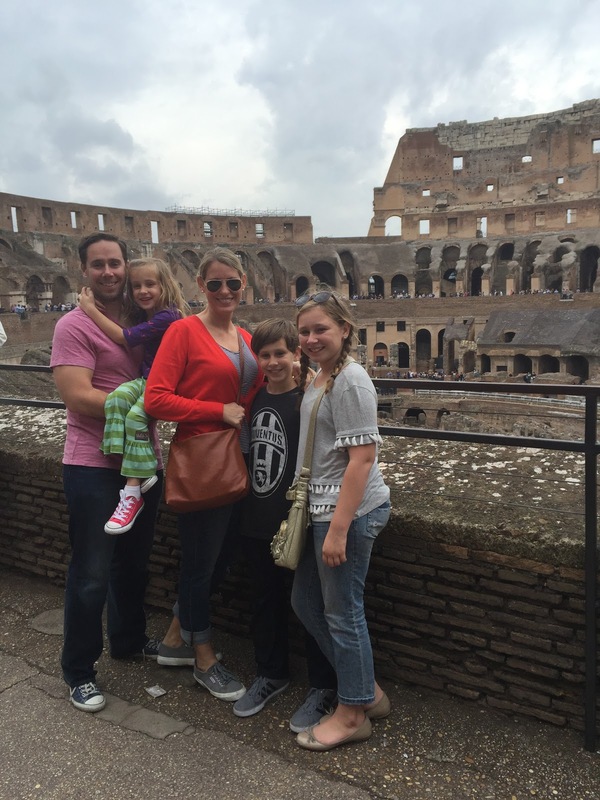 The Colosseum was our first stop, and probably the kids’ favorite thing in Rome. The selfie stick strikes again. 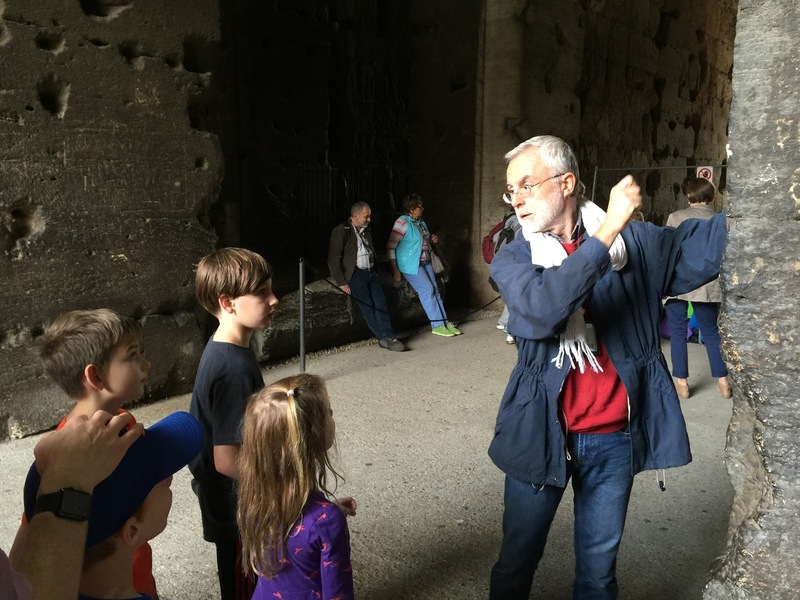 Our tour of the Colosseum with Paolo Lenzi was fantastic. Paolo was engaging with the kids but also expected a lot of them. He explained that they needed to listen to him, and he would also give them respect by listening to them. They loved his gory gladiator stories and he painted the perfect picture for them of what the mighty Colosseum used to look like. Paolo explaining all the holes in the Colosseum. The Romans dug all the iron out for money! 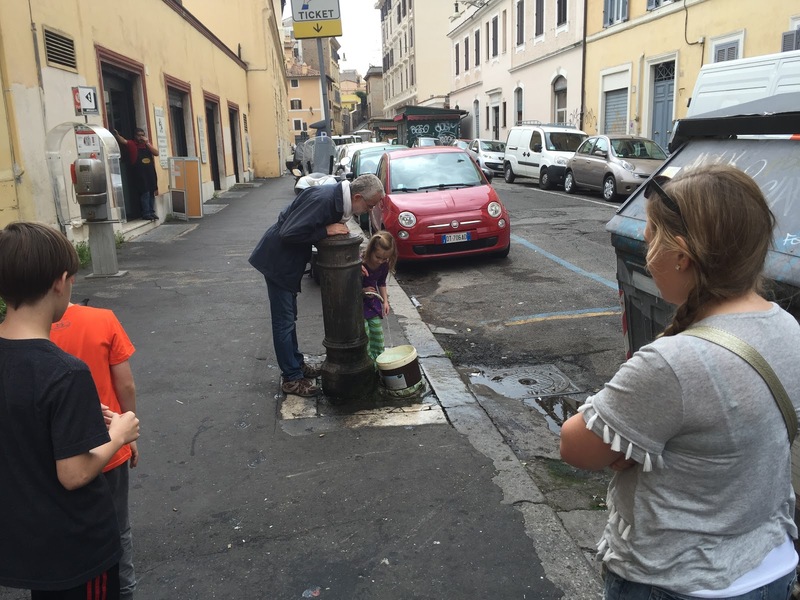 Paolo also took us on an adventure in Rome to find some city fountains and teach the kids how to drink like a true Roman child. There is a trick to it, and only locals know it. Tourists who don’t know the trick get very wet! 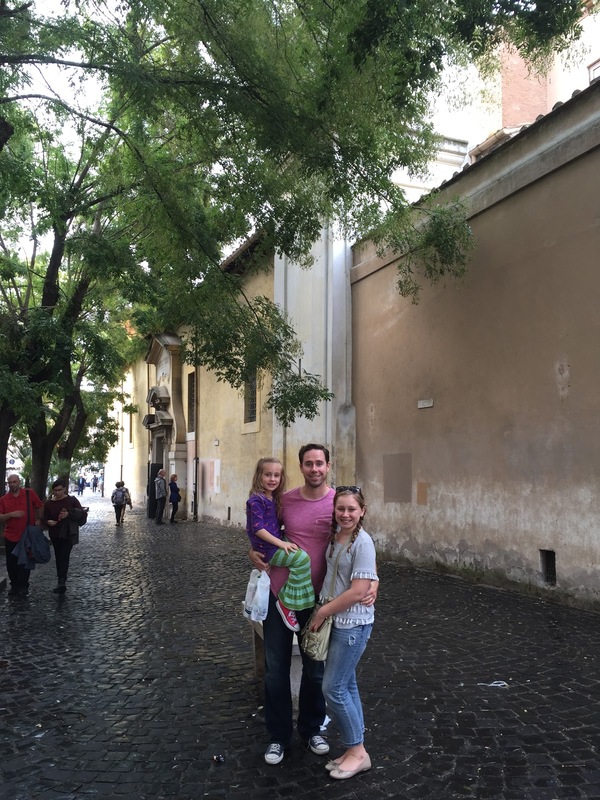 He also took us for a glimpse of underground Rome, to the Basilica de San Clemente. I didn’t get any photos of it inside (no photography allowed), but it was cool and felt very sacred. 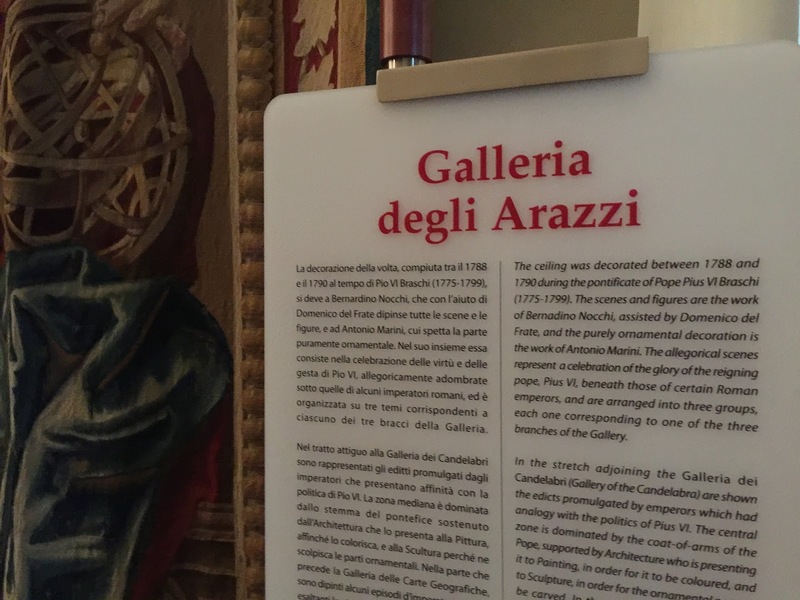 The current church is built on top of the original basilica, which dates from the 4th century, along with an ancient Roman house…get this…from the 1st century. It was pretty spectacular to be down there and see how well-preserved this little gem is. In front of Bascilica de San Clemente. Most people who visit Rome do not know about this hidden gem of underground Rome. 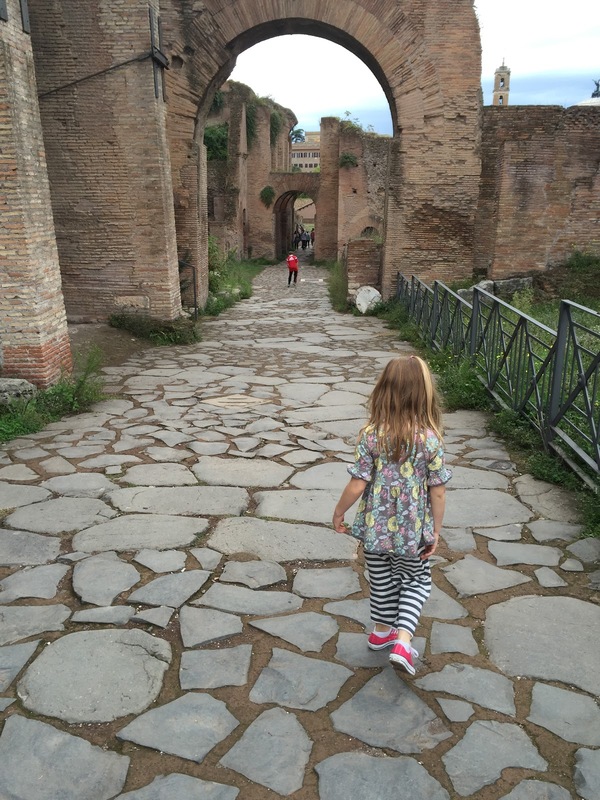 We explored the Roman Forum on our own. We bought a great book for the kids that showed what each monument/area used to look like, with peel back pages to reveal the current image. We ended up loving that book! It really helped give us all a great visual. 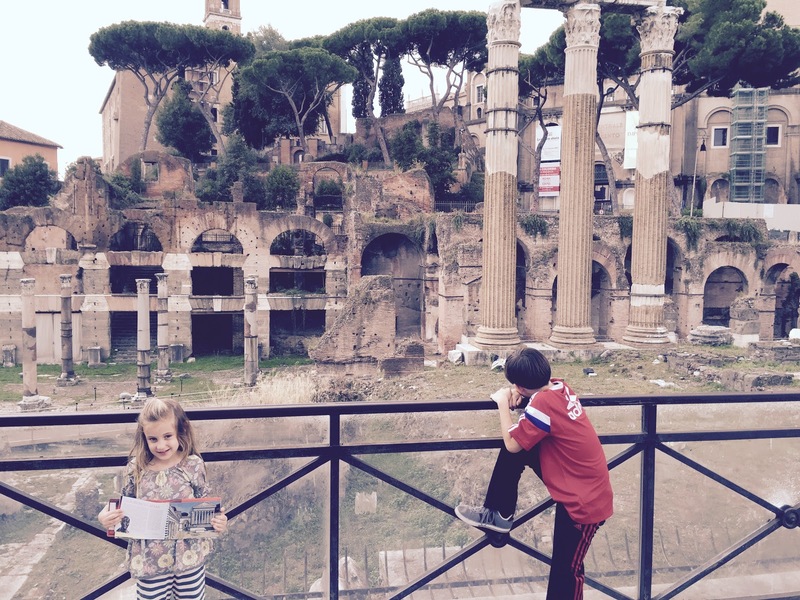 Otherwise, especially to the kids, the Forum just looks like a bunch of stones. Having that book gave them a real context for things. Chillin’ on pillars thousands of years old. 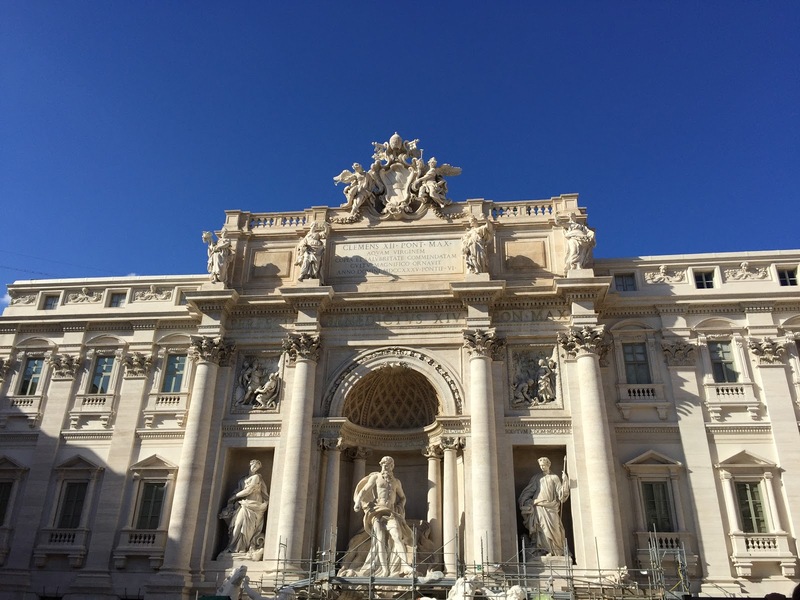 Stopping at the Trevi Fountain to toss a coin over our shoulders and make a wish. 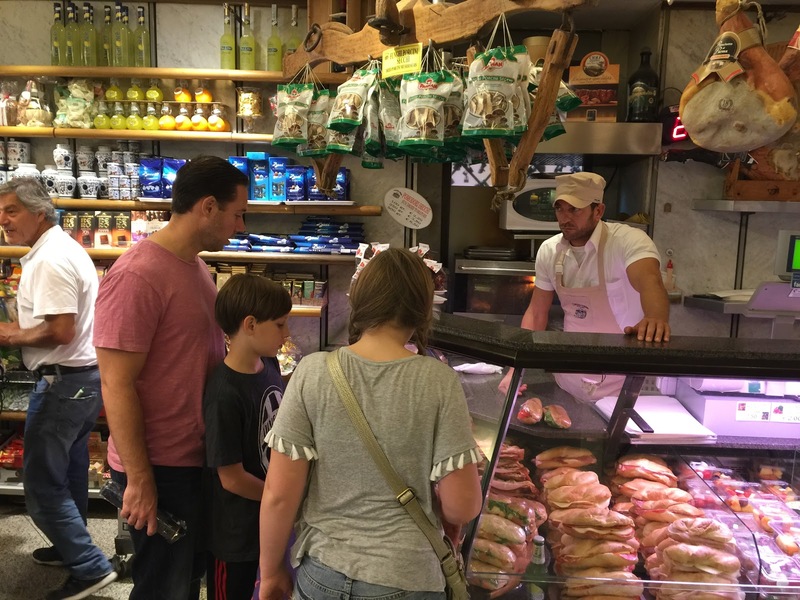 Checking out the Italian delis. 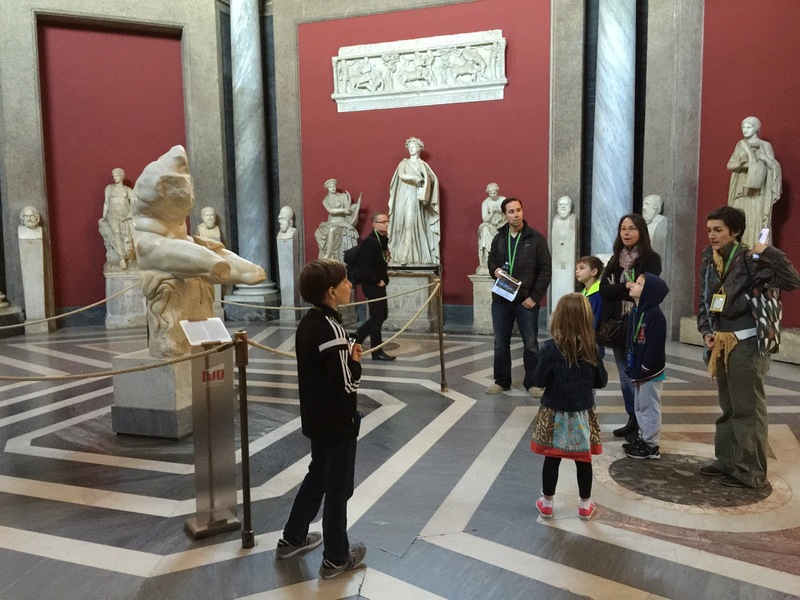 The two statues of Nike in the distance, behind Marc and the kids. 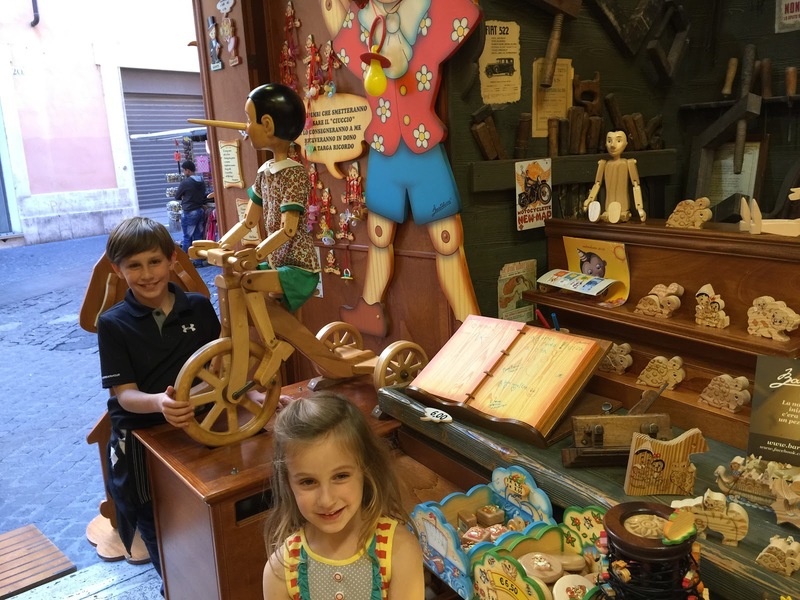 A stop at Bartolluci, the famous Rome Pinocchio toy shop, to buy gifts for their cousins and friends! We had the most delicious dinner the last night. 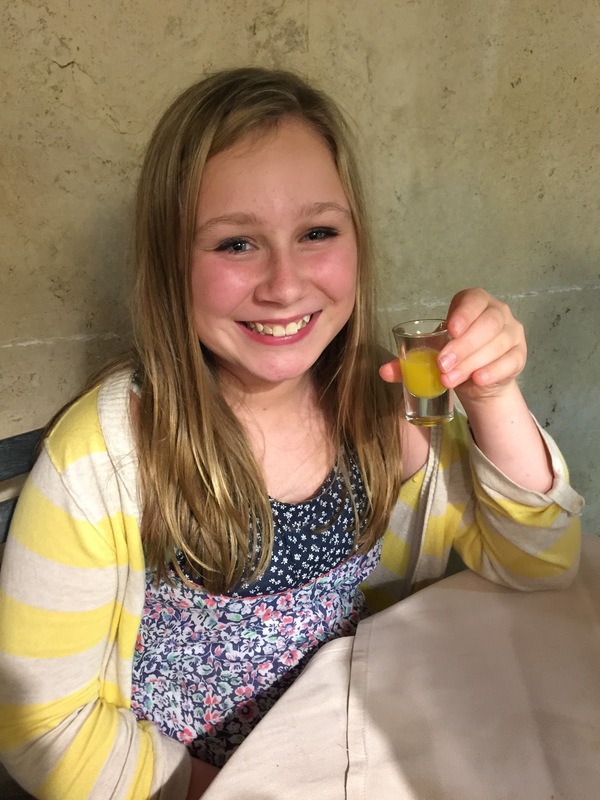 We aren’t quite sure what drink they served the kids “on the house” was, but it was in shot glasses and they sure looked happy! Next stop: Naples and the Amalfi Coast!